Recently kicked off Adobe Summit 2019, the world’s largest customer experience conference. Digital transformation is the mandate for every business and thousands of companies rely on Adobe Experience Cloud every day to manage their digital businesses across every stage of the customer journey. At Adobe Summit, Adobe unveiled the latest Adobe Experience Cloud innovations, including Adobe Commerce Cloud and Marketo Engage, as well as global availability of Adobe Experience Platform. Microsoft CEO Satya Nadella, Best Buy CEO Hubert Joly, Chegg CEO Dan Rosensweig, Intuit CIO Atticus Tysen and SunTrust Bank CMO Susan Johnson shared their respective enterprise playbooks for digital transformation. Additionally, Adobe announced key strategic partnerships with ServiceNow, Microsoft and LinkedIn to accelerate Customer Experience Management (CXM) across enterprises. New Innovations in Adobe Experience Cloud. Available globally today, Adobe Experience Platform is an open and extensible platform that stitches together data from across the entire enterprise, enabling real-time customer profiles leveraging Adobe Sensei artificial intelligence (AI) and machine learning. Adobe Experience Platform activates content based on these customer profiles to deliver rich, relevant experiences in real time. It empowers the company’s global ecosystem, which now includes 13,000 agency, solution and technology partners and more than 300,000 developers. For more info, visit Adobe. Adobe Analytics Cloud, the core system of intelligence and activation for CXM, is adding more capabilities to provide accurate and timely insight into cross-channel consumer behavior, along with intuitive, automated audience segmentation. Now, Adobe Audience Manager, combined with Adobe Experience Platform, delivers a real-time Customer Data Platform (CDP) that brings together known and anonymous data to activate real-time customer profiles across multiple channels throughout the customer journey. Adobe Analytics, with Adobe Experience Platform, is giving brands a new way to interpret insights from both online and offline data in real time. New Journey IQ in Adobe Analytics stitches together the full customer journey to ensure the right customers are targeted at the right time. A deeper integration with Adobe Advertising Cloud unites disparate data and inventory solutions, eliminating media silos and ensuring that marketing and advertising efforts are aligned. Additionally, Adobe Analytics has integrated commerce dashboards from Adobe Commerce Cloud. For more, visit Adobe. Adobe Advertising Cloud gives brands the functionality needed to plan, buy, measure and optimize advertising. Adobe Advertising Cloud added capabilities to unite and automate cross-channel advertising campaigns, including all forms of video, with brand safety built in. In a new partnership with Roku, Inc., Adobe Advertising Cloud customers can now leverage first-party data — including a brand’s own audience segments gleaned from marketing and advertising efforts via Adobe Analytics Cloud — to target audiences on Roku’s over-the-top TV inventory. Detail news here. Adobe introduced Adobe Commerce Cloud — built on Magento Commerce and leveraging an ecosystem of more than 300,000 developers — providing an end-to-end solution to optimize both customer experience and business operations by powering integrated and fully managed commerce across all storefronts — physical, digital and virtual. Native integrations with Adobe Experience Cloud, including Adobe Analytics and Adobe Experience Manager, and added intelligence powered by Adobe Sensei offer rich insights in commerce dashboards and deliver engaging commerce experiences in real time. See the details at this blog post. Adobe and ServiceNow announced plans to enable integrations between Adobe Experience Platform and the ServiceNow Now Platform to enhance Adobe’s real-time customer profiles with ServiceNow’s rich customer support data. This will create a more comprehensive view of a customer across the entire digital journey, from acquisition to service. Additionally, Adobe Experience Cloud solutions will integrate with the ServiceNow Now Platform, including its Customer Service Management (CSM) solutions. Adobe and ServiceNow will partner to enable their mutual customers to integrate and leverage digital workflows, service catalogs, intelligent content and knowledge management capabilities. More info at this press release. Adobe’s partnership with Microsoft and LinkedIn will create account-based experiences (ABX) through data integrations and new marketing and sales capabilities. By aligning key data sources to populate account-based profiles, the companies are collectively empowering B2B marketers to easily identify, understand and engage customer buying teams. This partnership will result in a more personalized experience at both the individual and account level on critical marketing and sales platforms like LinkedIn. Details, here. Also taking stage at Adobe Summit will be Academy Award-winning actress, producer and Draper James founder Reese Witherspoon and New Orleans Saints quarterback Drew Brees, who have both led transformative change in their respective industries. 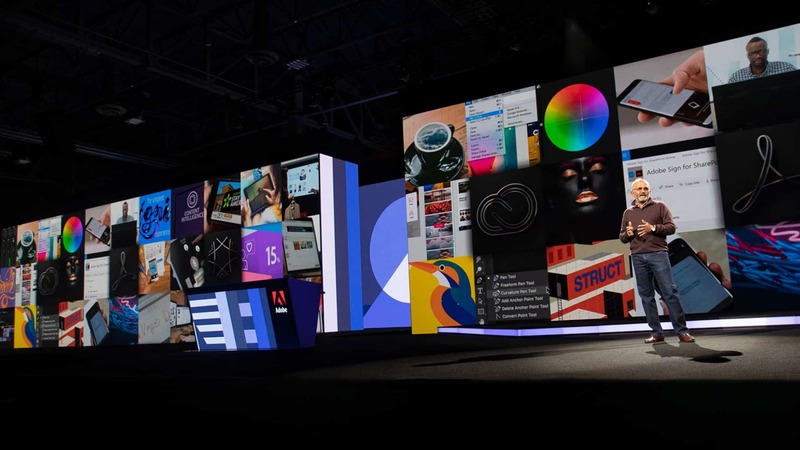 Adobe Summit also featured the first-ever Adobe Experience Maker Awards, as well as Marketo’s Revvie Awards, which celebrate brands driving the world’s best customer experiences. Read this press release for more information.